Installing an OPTIMA® BlueTop® high-performance AGM battery in your boat or RV means more running time and up to 3 times more recharges than what youd get out of a traditional battery. Its perfect for boats with electric trolling motors, onboard electronics or stereo systems and RV's with creature comforts that tend to drain batteries quickly. In addition to providing weight savings and outstanding vibration resistance, the BlueTops efficient power delivery and faster recharge time mean youll spend less time worrying about your battery. The OPTIMA BlueTop is ideal for those who need a sure-starting, strong cranking, maintenance-free power source. 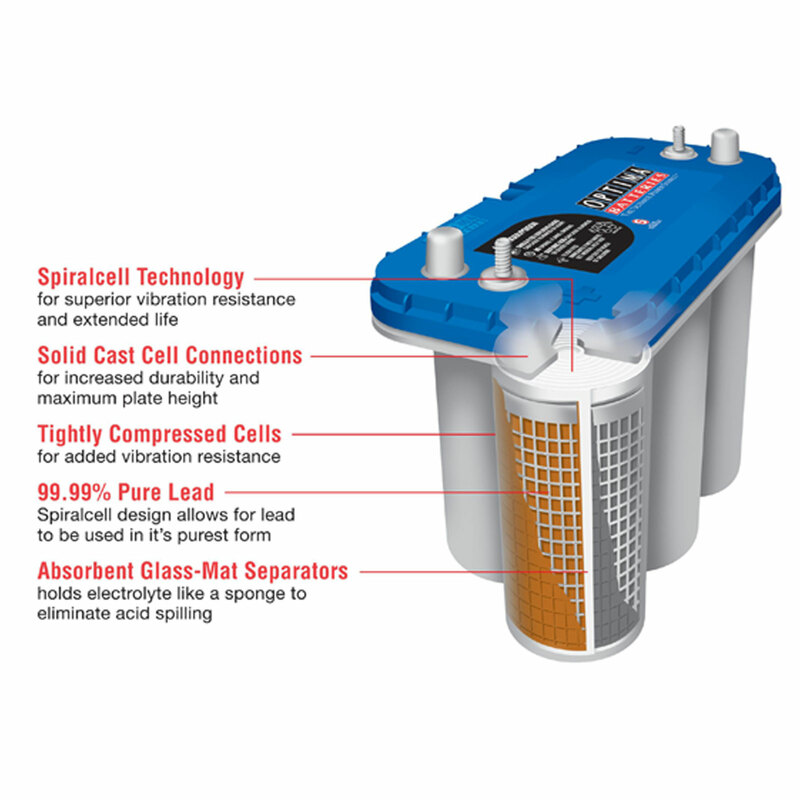 These batteries contain High Purity lead-tin alloy with Wound Cell configuration utilizing proprietary SPIRALCELL® technology. Cyclic or Series String Applications: 14.7 volts. No current limit as long as battery temperature remains below 125°F (51.7°C). When current falls below 1 amp, finish with 3 amp constant current for 1 hour. Need more Optima OPT-D31M? We offer great discounts on quantity orders and FREE SHIPPING offers are available.